So, I missed a week of what we ate. Actually, I think I might have missed two weeks. Basically, it was two weeks of joyous delight. The week before last started pretty normally. We ate nice normal family meals. Then on Thursday, I got a cold, so ready-made soup was consumed aplenty. On Friday, my mum came to get the kids to take them away for half-term (yes I totally am that parent that can bear to be without her kids for one week a year. Sorrynotsorry). Me and husband had a giant takeaway that lasted two days and went out for a Sunday lunch. Awesome. Last week, we went to Sweden, and a bit to Denmark. We had the most amazing time. We ate lots and lots of Scandinavian delights. There were pastries, meatballs, steaks, brilliant cheeseburgers, mussels, pasta, chocolates, cookies, and the hotel that we stayed at had the most amazing breakfast buffet, I even tried some pickled herring. Then we came home and had Ikea Meatballs because we’ve been Swedificated. Safe to say, after four-course breakfasts and huge dinners every day, getting back to normal has been tough. I didn’t gain any weight, thanks to walking 25000 steps every day, but this week I’ve felt absolutely starving by 9 am, muesli just is not cutting it. We’ve had another slightly funny eating week though. I ordered my online shopping from Sweden, to come the morning after we got home. So obviously all that I could remember that we needed was pasta. Equally obviously, we didn’t need pasta; we had about eight packs in the cupboard. Similar story for the potatoes. So, there was no meal plan for this week. It’s been a make it work with what we’ve got kinda week. Despite me spending the same as I always do, we’ve had to pop to Aldi 900 times for top-ups (and wine, because we can’t afford to drink in Sweden) and have eaten crap. So basically this unplanned edition of my “what we ate” very much supports the benefits of meal planning. I’m starting from Sunday for a change, because I’m writing on Saturday and I don’t know what we’re eating tomorrow yet, because I plan and shop on Saturdays. Sunday was funny, we were still in our week off, and my parents were here to return the kids. So we had Sunday lunch. I loved this. Sundays for me are usually a bit manic. I try to take the kids out on Sunday mornings, or if we’re staying in, we have a treat breakfast and watch a film. Then I have to organise school uniform, order lunches and get Michael on his homework. Then I have to start prepping the roast, but husband doesn’t get back until 6ish, and I normally have work to do in the evening, and the kids need baths, and everything is bloody mental. So, this week, husband was here, and we had a roast for lunch. It made my life about 9 million times easier. Even better, my mum bought the lamb, and I didn’t have to pay for it! Win. I’ve never made or indeed eaten a hotpot before. Going, to be honest, I don’t think I was fully aware of what a hotpot was. But I googled “leftover lamb recipes” and hotpot popped up. So I had a look and made one with our leftover lamb and some other bits that we had in. It’s basically a lamb stew, but the potatoes are sliced and put on the top, instead of in the stew. Amazing! I fried some onions and leeks in a little oil in a large ovenproof dish. I then added the chopped up lamb, 2tbsps of cornflour that we’d got left, and about 700ml of beef stock, a splash of Henderson’s Relish, a pinch of salt and pepper, 1tsp of Rosemary and 1tsp of thyme. I let this simmer for 30 minutes, before stirring in 4 large, sliced carrots. I let this cool while I peeled and thinly sliced four biggish potatoes. I lay these on top, brushed them with melted butter and put it all in the oven for an hour on 180. 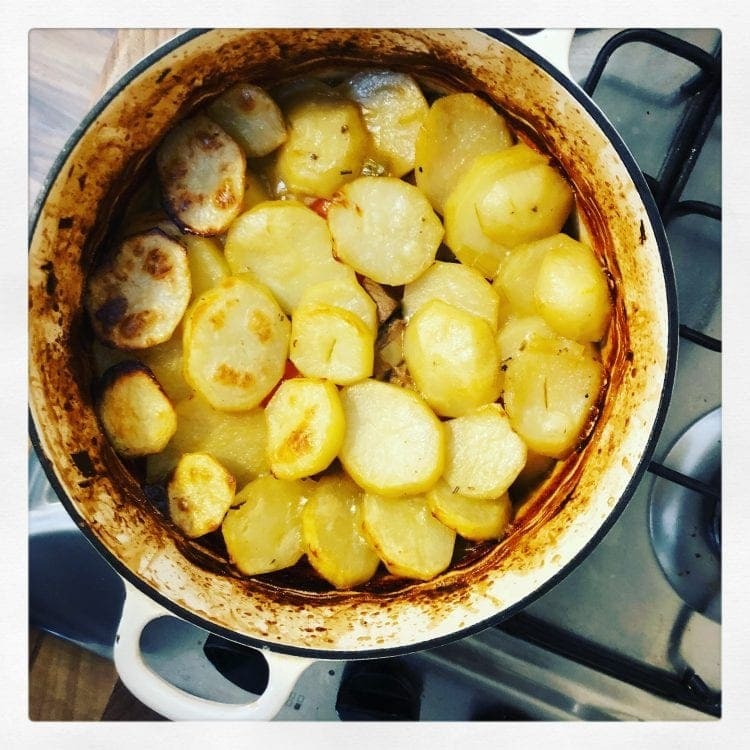 I had to go and do the school run then, but later when husband got in, I put it back in the oven for 30 mins on 200 degrees to warm it up and brown the potatoes. Definitely a new favourite in our house. This is maybe husbands favourite. I don’t know why but I was in a please husband mood. So we had this, and I bought him Solo, and we watched it with chocolate and wine once the kids were in bed. This was when the popping to the shops started. Another of our favourites though so always good. Thursday again was a result of poor planning. There were sausages in the fridge, so I’d vaguely said toad in the hole. Then we went for a walk around Rother Valley and had sausage sandwiches. Now I love a sausage, but I couldn’t face so many in one day. We had sweet potato fries in the freezer though, which I am completely addicted to, so we picked up a pizza to go with them. And more wine. Obviously. This actually worked out better, because Michael is back from his Dad’s on Friday, and sausages and Yorkshire puddings are his favourites. Wild and Game recently sent me a sample of one of their game ready meals. The Pheasant Tikka Masala. I’ve never eaten Pheasant before I don’t think. Not that I remember anyway, and this was a really easy way to try it. One pack easily fed me and husband (the kids had a chicken curry) with some rice and naan bread, and I was pretty impressed with how much meat was included. There was plenty of tender meat, and the sauce had a really nice flavour. I’d certainly like to try more game generally, especially in nice family meals like this, and if you’ve never had it before, Wild and Game meals are a really tasty and convenient way to give it a go. So basically, meal planning rocks.